My version of Buffalo Chicken Dip uses fresh cooked chicken, Louisiana hot sauce, ranch instead of bleu cheese dressing, bacon, and a mixture of cheddar and mozzarella cheeses. Y'all likely know this dip as Frank's Famous Red Hot Buffalo Chicken Dip, or just plain ole Buffalo Chicken Dip, some of you may even know it as Crack Dip, but I made some changes to the standard recipe and I really think it's the best chicken dip you could ask for! First I substituted fresh chicken in place of the more commonly used canned. I just find the flavor much better and more like real Buffalo chicken wings to be honest. If you don't want to fool with boiling up some chicken, just purchase a rotisserie chicken for supper one night and set aside enough for this dip. For my Buffalo Chicken Dip, I substitute Louisiana brand hot sauce, and instead of ranch dressing use your favorite mayonnaise and a packet of Hidden Valley Ranch dressing. J&D's Bacon Ranch Dressing and Dip Mix is also a great choice if it's available to you. I also think a combination of cheeses works best for this dip so I use a mix of cheddar and mozzarella. Garnish the top with a sprinkling of sliced green onion and some freshly cooked, crumbled bacon and you are in business. This version of Buffalo chicken dip turned out fantastic and would be a great addition to your next party, movie night, or gathering of friends. Preheat oven to 350 degrees. Cut the cream cheese into chunks and place into a deep dish pie plate. Microwave on low/defrost for about 1 minute to soften. Add the ranch mix, 1/4 cup of mayonnaise and hot sauce; mix. Add the cheeses, stir; add the shredded chicken, stir. Add additional mayonnaise if it is too dry. Bake at 350 degrees for 20 minutes, stir and garnish with sliced green onion and bacon, if desired. Serve on a warming platter with a side dish of mixed crackers, corn chips, Triscuit crackers, tortilla chips or your favorite dipper! Reheat in the microwave if needed. Cook's Notes: Do not be tempted to use more hot sauce until you have tried it with the 1/2 cup! Any more is likely going to be too much fire for most guests. Buffalo chicken dip, by virtue of its name, would typically use bleu cheese and not ranch dressing, however, there are a wide range of folks who do not find bleu cheese palatable or tasty, and so we substitute with more widely accepted ranch. If you want to prepare the dip in a more traditional manner, crumble in fresh bleu cheese with the other cheeses, or else use a quality bleu cheese commercial dressing, and eliminate the mayonnaise. You can also combine ranch and bleu cheese which will help to tone down the sharpness. Use other varieties of cheese you like - colby, jack or a combination of the two are good here. Tailgate version: Triple and prepare in a disposable aluminum pan. Cover with aluminum foil. Place the pan on a hot grill and heat until bubbly. Crockpot version: Double and combine all ingredients in a microwave safe mixing bowl, except use only half the cheese in the dip, reserving the remaining half. Heat in the microwave for 3 minutes on high, stop, stir and continue heating another 2-3 minutes. Stir and transfer to a crockpot. Heat on low for at least 30 minutes or until needed. Before serving, stir, top with remaining cheese, cover and let heat until cheese on top has melted. Microwave version: Combine ingredients in pie plate and microwave on high for 3 minutes, stir. Microwave another 3 minutes, stirring again. Time will depend on your microwave. Variation: Instead of mixing together, layer ingredients in the baking dish in this order: Blend cream cheese with mayo for the first layer, toss chicken with the hot sauce for the next. Toss the cheeses with the ranch dressing mix and add on top of the chicken layer. Substitute an envelope of J&D's Bacon Ranch Dressing and Dip Mix for the Hidden Valley Ranch. Can also substitute canned chicken, drained - you'll want a larger sized can of quality chicken, two is even better, or substitute chicken you've pulled from a rotisserie chicken. Buffalo Chicken Macaroni and Cheese Bake: Prepare 1/2 pound of your favorite short cut pasta (rotini, penne, elbow, medium shell) al dente. Place into a buttered 2 quart casserole dish and toss with shredded chicken. Substitute 8 ounces of cubed Velveeta for the cream cheese and add 1 can of condensed cheddar cheese soup with one cup of milk. Omit the mayonnaise. Heat the soup, milk, Ranch dressing mix and cheeses until well blended, stir in the hot sauce (to taste) and pour over the chicken and pasta. Bake at 350 degrees for 30 minutes, or until hot and bubbly. Remove and scatter the bacon and green onion on top. Hi, I saw your comment on the featured SITSA blogger site and just wanted to stop by to say hello. 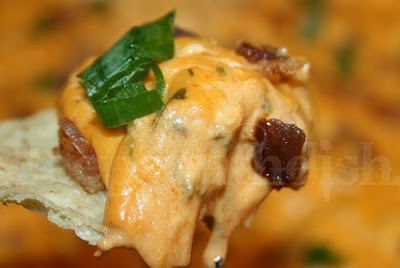 This Buffalo Bacon and Chicken Dip looks absolutely fabulous - I'll have to give it a try! Blogging is kind of new to me, so I'm watching and learning every day. We are waiting for a 2-day blockbuster snowstorm up here in New Jersey. Take care!! Great dip Mary! You know I love the spicy stuff and hubby bacon, couldn't go wrong with this one!!! My Hub wants to come over the next time you make this! I love the changes! This looks great. I am going to save this for football season! OMG@ that looks and sounds fabulous! Wish I could reach through the screen and grab this bowl of dip-it looks so addictive! My guys will love this! Thanks Mary. Thank you for this..I had some chicken in the fridge that I needed to use up. This looks delicious!! On a different note, My mom is traveling down towards NOLA this weekend. She has specific instructions to look for that Baconnaise :)I sure hope she can find some! 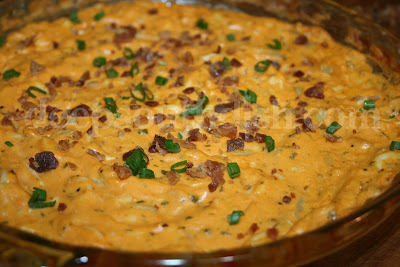 Love me some buffalo chicken dip! I like the tailgate version, but of course I would. This is just about my favorite dip and adding that bacon flavor can only be a good thing. I need this dip in my life. Oh MY Word! I could totally inhale this right now:D It looks insanely delicious. Here is a variation even Buffalo Ny people love. drain chicken and place in pan over medium heat. smash the chicken up to make it shredded while it warms up. Add cream cheese 1 block at a time and mix into chicken until melted. Let this simmer and mix well until warm. Add 1 cup of shredded cheese and mix until melted. Remove from heat and add remaining shredded cheese over top of dip. use corn chip or even put this on bread as a sandwich. Thanks Brax! Never thought to try this as a sandwich spread - interesting! The one thing I have found the sets any Buffalo Chicken Dip over the edge is using Chicken-in a -Biscuit crackers. Typically, I find these things fairly repulsive, but the flavor is amazing with this dip!!!! Kicks up the chicken flavor a notch. Bet that is good Christie! I have a confession. I used to eat those crackers all the time as a teenager, and I still LOVE them! Thanks for sharing that tip!! Just ran across your website! Glad I did....everything looks delicious!! Can't wait to try some of your recipes! Hi Carol & welcome! Thank you so much - I'm glad you found us too! !